No chance of getting bored! During the day you’ll have a lot of driving, but you’ll also have time to be involved in some water pistols battles or tyre repairs, between other VW Golf Challenge traditions.. And at night… A lot of fun and some crazy parties between the challengers coming from all around Europe that will end up being friends forever. Don’t miss it! Camping, orientation challenges with GPS… and without it! 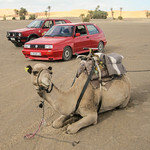 Driving through some of the best roads in Morocco, amazing off road tracks, and even in the dunes… A very exciting experience where you’ll get really amazed with the Golf habilites and exceptional reliability. Sign up for 1985€/car with 2 persons. It’s also possible to come alone or 3 in a car! Ask us! The Vw Golf Challenge by “The Danis” is a non competitive raid where the most important aspect is to enjoy the whole experience. Fun, fellowship, but the most important aspect: solidarity. Every single team must bring schooll stuff, toys or clothes that you will delievery in some of the poorest areas of Morocco during the adventure.